I love making Christmas decorations from paper. I can enjoy them for the one season, but not necessarily have to pack them away for years and years. I’m picturing these little trees in the center of a buffet. You don’t even have to worry about getting food on them. There are three different options here for these trees. I have a plain, white version here so you can let the littles decorate them, a set of three in varying shades of green here and, my favorite, a set of three in colorful prints here. You can even go crazy and display all of them together. To make these, print out your trees on regular paper. Cut the V shapes on each tree. I found this was easiest with a cutting mat and Xacto knife. Cut around the tree. Clip in on each side of the star, but leaving the center attached to the tree. 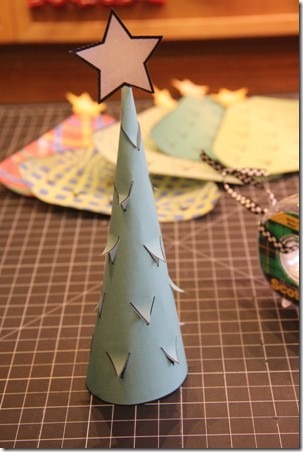 Roll the tree into a cone, matching up the edge and dotted line on the back. Secure with tape. This is easier if you have an extra set of hands so one person can hold the tree while the other applies the tape. 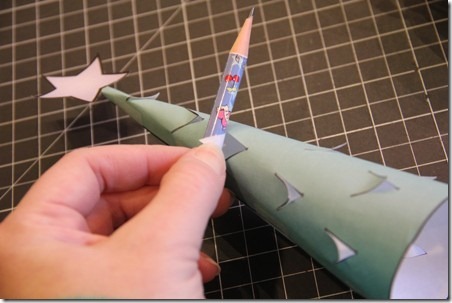 To curl the branches up, lay a pencil on top of the V and hold the paper while twisting the pencil upward. I gave up trying to curl the very top V under the star. 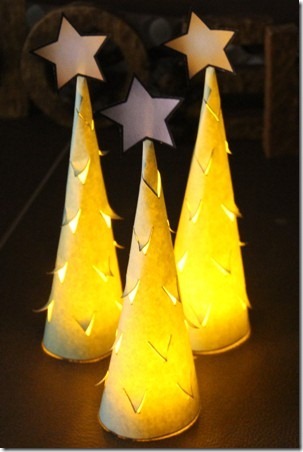 To light these up, set them on top of a battery-operated tea light. DO NOT use a tea light or other candle with an actual flame. I didn’t really need to tell you that, did I? I actually really like them even when they aren’t lit up. These might get packed away and brought back out next year after all.